A GAP Analysis recently conducted by law firm Pillsbury, LLP – the largest IT contract negotiating firm in the US with over $500 Billion in deals – summarized that Core IT supplier agreements and pricing ‘enjoyed’ by community banks and credit unions have not changed since the 1980s. Core IT suppliers have been known for issuing complex and onerous agreements to community institutions for decades and light now being shown by Aaron Silva is beginning to unveil what’s really behind the curtain of these one-sided deals. This in-depth discussion will demonstrate how current day contracts unfairly punishe banks and credit unions for success and routine corporate events. Attendees will learn what it takes to get a deal that considers their needs as a modern financial institution operating in 2017 — one that’s comparable to the contracts their big bank counterparts enjoy. The time has come to pay attention to “the man behind the curtain” or risk overspending hundreds of thousands of dollars annually on bad deals. In this session, Aaron Silva will reveal the shocking truth about what community banks get versusnational banks [from these same Core IT suppliers], how similar organizations in other industries are treated, and how the Golden Contract Coalition plans to change the game once and for all by putting more power back into the hands of community financial institutions. This banker-only session is tailored to C-Level executives of institutions between $300 million and $15 billion in assets size outsourcing to any one of the major Core IT suppliers. for community financial institutions. 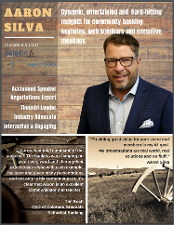 An entrepreneur and industry veteran since 1991, Aaron founded Paladin fs, LLC in 2007 and launched Golden Contract Coalition in 2016. His invention of the Paladin Blue Book has leveled the playing field in contract negotiations vs. national Core & IT suppliers, gaining his clients more than $300M in cost reduction and $100M in merger value accretion. In 2018 Silva expanded Paladin to include the Fintech Advantage division, now addressing the anticipated adoption of fintech services within the industry. By the end of 2019, the GCC will have more than $1B in combined contract value - the largest banking association focused exclusively on developing a fair "Golden" contract standard that all Core, IT and Fintech suppliers will ultimately adopt in order to do business with this industry..